We are horse shopping this month, and our first purchase was negotiated last week. The new geldings name is Shakir, and he is a pretty 6 year old Arabian that was bred in Rimini, and transported near Siena in the Val d’Orcia, which is where we found him. Last week Franco, Gianluca (the vet) and I all squeezed into the horse truck to drive the two hours to Monte Amiata to vet check him, and bring him home. He was a good boy, vetted fine,loaded immediately and traveled home without any issues. He has only ever done trail riding, so needs some fine tuning in his school work, but essentially hes a great little gelding with a lovely head on his shoulders. On Sunday he worked in the indoor arena with two young horses in training, and was very well behaved. Lets hope he carries on this way, and will be out and about this summer exploring the trails of Montaione with us! 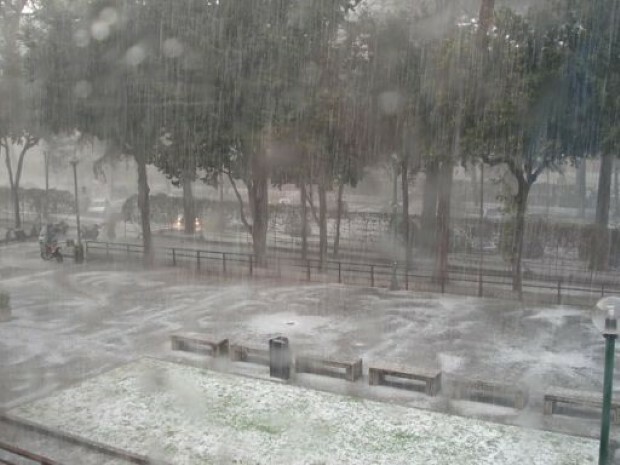 We have had lovely sunny weather up until yesterday, but now as November comes to an end the winter weather is really kicking in, with torrential rain and storms causing weather alerts throughout Tuscany. Toiano , the abanoned village is one of our day ride destinations. Located high on a cliff face made up of sparse vegetation and old fruit trees (planted years ago when the village was still occupied, the village has an incredible panoramic view of Volterra in the distance. The village once was a thriving community of over 500 people, most of which abandoned the area around WW2 or shortly after. There is no longer drinkable water in the village, and the few current inhabitants (choosing an alternate lifestyle in the abandoned town) need to bring water up daily. The town has one sole street ‘Via del Castello’ that runs 50 metres along two lines of old stone homes. The forest surrounding Toiano, a dark and mysterious wood – holds a dark secret. That of the Corpus Domini murder. 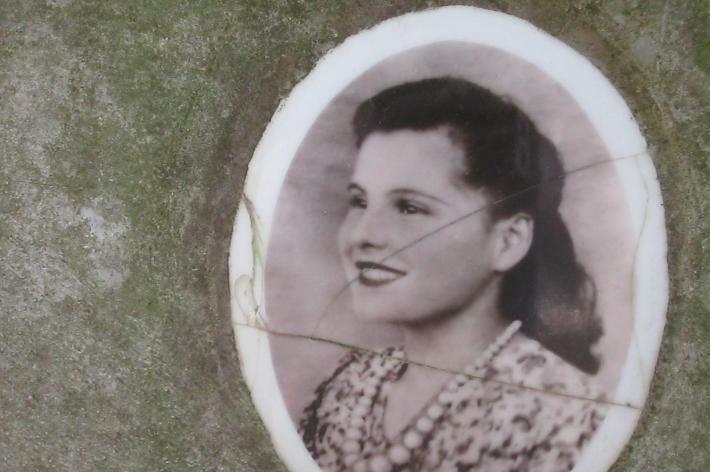 The 5th of June 1947, on the day of the Corpus Domini holiday Elvira Orlandini went to fetch water from the Botro della Lupa and never returned. The tragic murder story of Elvira has all the elements of a crime novel. A beautiful girl – perhaps too beautiful, found murdered – almost decapitated, half naked and lying in a puddle of blood. The murder weapon (a large knife) was never found, and the murderer took with him as a keepsake the girls underwear. Originally the boyfriend was blamed. Farmer Ugo Ancillotti served two years (continously professing his innocence) and was then let free due to lack of evidence. The story received coverage all over Italy, and the police were sent letters from all over Europe proclaiming who was the true assassin. To remember the poor girls horrific end, there is a statue of ‘Bella Elvira’ on the road up to the village. 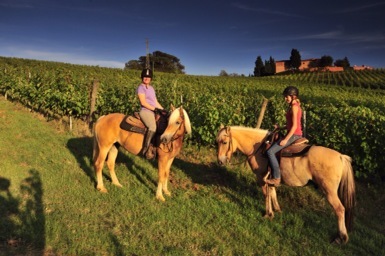 We have a wonderful collection of horses, from the hairy Fjords to the smart Quarter horses, but the queen of our horse riding operation here in Italy, is our one and only Aveglinese (Haflinger). The Aveglinese horse originates from Avelengo) in the South Tyrol of Italy. . This is a very ancient breed according to texts that talk about the blonde beauties, even though it was only officially founded in 1874. This is a muscular horse with a thick coat of chestnut brown hair, ranging from blond to chocolate brown. The mane and tail are thick and blond and they are the most numerous Italian breed due to their hardy structure and friendly personalities. 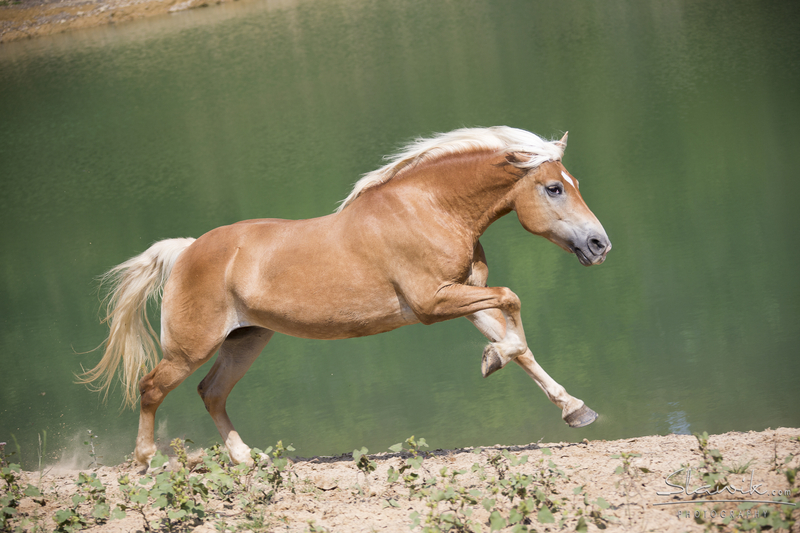 Our beautiful queen of the stables is known simply as ‘The haflinger’ since she is the only one we have. Shes bossy, quirky, pushy and greedy – but as a trail horse, she is one of the best-and often used as our guide horse. Point this mare wherever you want her to go, and she will go there. She will barge through hedges, leap ditches, pick over a low fence, and swim up to her chest when required. She is usually the only mare that comes out on the trails, and knows she needs to keep the boys in line (which she always does). 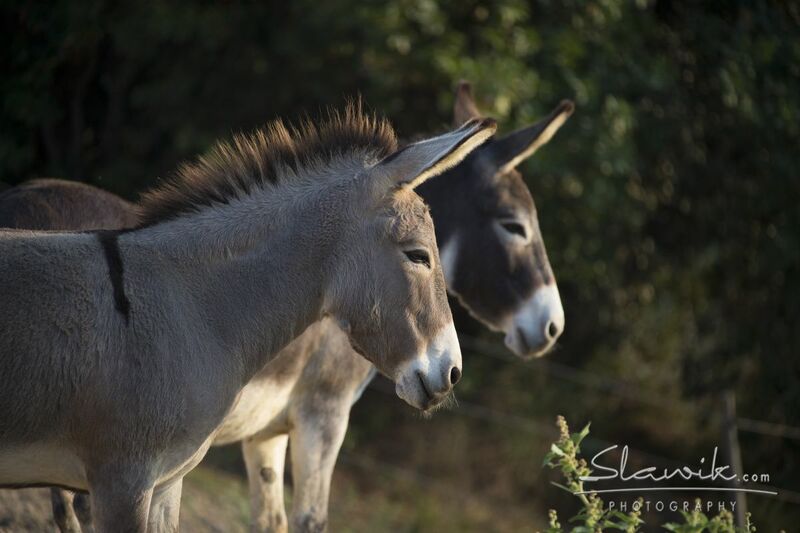 Dont tell the horses… we have two donkeys on the property! Yesterday whilst out checking on one of the longer trail routes we take the horses on, I had a flashback to two years ago when we took a group out to Cedri for a picnic lunch. 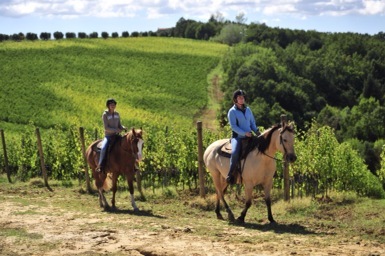 This was a magnificent horse ride along some lovely diverse terrain, and the tiny hamlet of Cedri was a great spot to tie the horses and sit back for lunch. Unfortunately en-route there was a rouge donkey free from his field and desperate for company. Panic ensued with Dali the lead horse completely PETRIFIED of these strange, long eared beasts!! Luckily, the easy going team of trekking horses behind him took the funny looking creatures presence all in their stride (literally) and all passed unscathed. Donkeys have long been the cause of problems on rides out, which is strange really, considering how closely related to horses they are. Unfortunately the horses don’t realize this.. and the noise, the smell… not to mention the appearance, can send them into anxious fits. Even Pedro (one of our safest old trail horses), still tenses up when he sees the donkeys up close. 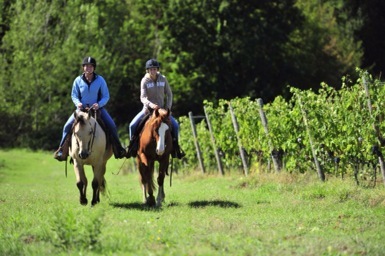 An old client of ours once told me a tale of a trail ride in France. The group of 8 riders was trotting along a country lane when suddenly panic. All the horses bolted. Eight horses madly galloping out of control, with even the guide unable to do ANYTHING. At the end of the lane, the horses slowed, and whilst still unnerved and snorting, the riders managed to pull them up. What had caused them to panic so. Nothing less than two maneating donkeys that were on the other side of the hedge un-witnessed by the riders. So. Its not a bad thing that Franco has his own two donkeys living here at Castellare. That way the horses at least are well used to hearing that strange noise, and seeing those long eared beauties up close. 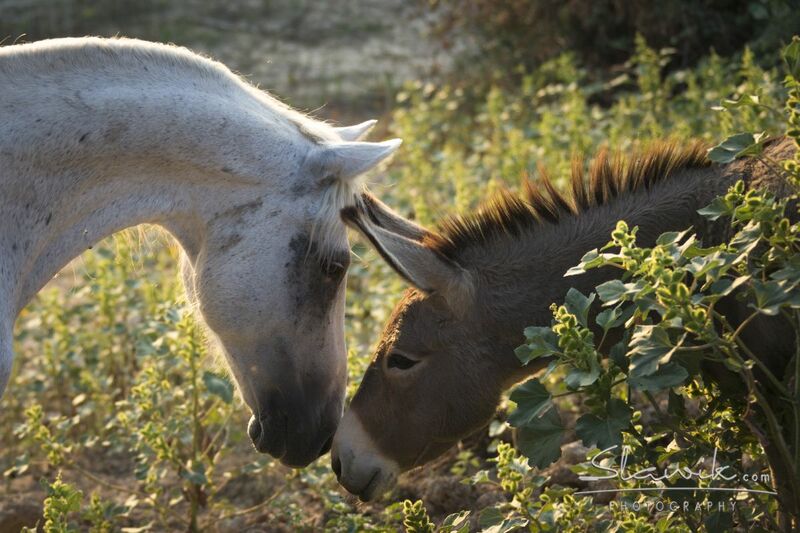 They do still live in separate paddocks , but this great pic below (of Blanco and the younger donkey) shows that horses and donkeys can be pals. This pic was snapped by the wonderful Christiane Slawik, who caught the magic of the moment completely by chance as we shot Blanco running at liberty in the bottom field where they live. Bellissima! Our most promising three year old Wimpys Jac Sun will be competing at the IRHA RRHA Futurity at Manerbo this weekend under rider Lorenzo de Simone. Check the pair out in this video below. We wish them both the best! These pretty photos were taken by Journalist Cate and her boyfriend Nate. The weather was glorious over these days, and in the top picture (with Fjord Otto and the Haflinger mare) we had freshly returned from a great ride in the Castelfalfi estate with plenty of lovely canters and photo opportunities. I recommend this week as one of the nicest times to visit Tuscany (mid September) as the weather is warm with cool evenings. Our 2013 dates and rides will be out soon on the In the Saddle website so do check them out!